Chancellor George Osborne's "inflexible" budget surplus target may mean sudden tax rises or spending cuts, independent economists suggest. The Institute for Fiscal Studies (IFS) said that Mr Osborne's pledge to run a budget surplus "in normal times" from 2019-20 was simple but would require a "precarious balancing act". 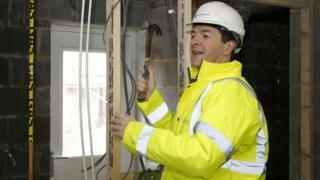 The result could be "big tax rises or spending cuts with very little notice", the IFS concluded. The next Budget is on 16 March. The IFS publishes its annual Green Budget document ahead of the actual Budget every year, highlighting economic conditions and the challenges facing the chancellor. The independent economic think tank has concluded that Mr Osborne's target of a balancing the UK's books by 2019-20 was inflexible, and could have tax and spending implications were he to receive "unfavourable" economic and fiscal forecasts. The UK had only run a surplus eight times in the last 60 years, the IFS pointed out. "Even if the chancellor gets to the March 2019 Budget with his plans intact, past errors in official forecasts suggest that there would be more than a one-in-four chance that he would need to implement in-year tax rises or spending cuts to deliver a budget surplus in 2019-20." Mr Osborne knows that he can set as many fiscal mandates as he likes, the public are unlikely to notice. And there the figures are pretty gloomy. In the meantime, the chancellor still had a programme of promised tax cuts to deliver, faced uncertainty over what the Treasury might receive in tax, and needed to maintain a squeeze on government spending. For example, the government has promised to allow workers a larger amount of income before they start paying income tax - a promise that will cost £8bn a year and which is currently unfunded. The IFS said that even if economic figures were good, the forecast of a budget surplus by the end of the decade assumes putting up fuel duties in line with inflation, taking child benefit away from more high-earning families, and allowing more households to be dragged into the 45% top rate of income tax by keeping the threshold frozen at £150,000. Uncertainty over what will happen to the UK economy meant he might have to respond with some "tough decisions", the IFS concluded. "How he responds to any further unpleasant fiscal surprises may, more than anything we have seen so far, come to define his period as chancellor," said Paul Johnson, director of the IFS. Oxford Economics, which co-authored the report with the IFS, is predicting "relatively disappointing" UK growth of 2.2% in 2016, but said strong consumer spending had seen a "sugar rush" owing to low inflation caused by low oil prices. This was likely to continue. The environment for business investment remained "favourable", it added. The Bank of England, in its latest Inflation Report, cut its forecast for growth this year to 2.2%. In November it had predicted growth of 2.5%. UK manufacturing: Whatever happened to the 'march of the makers'?